Paneer stuffed Potoler Dolma is one of the delicious recipe with silky smooth gravy which will surely bit any vegetarian menu with some pulao or rice.The recipe can also be non-vegetarian type with coconut and shrimp mixture or may be with mutton or chicken keema as a stuffing in pointed gourd. 1. Cut small portions off from both the ends of the pointed gourds. Scrape the skin very lightly using the reverse side of the knife. Wash the pointed gourds after scraping the skin. Now either with the handle of a metal spoon or with the head of the pillar, scoop out the seeds of the pointed gourds from inside. Take care about this that the parwal should not break. Keep all the seeds aside as we will use them for the stuffing. Also, keep the end of the parwal which you cut and removed. 1. Take a deep bottomed pan and pour milk into it. Let it boil on high flame and once it boils, lower the flame. Now, add lemon juice and stir continuously. Stir well and you will find that milk will begin to curdle and separate. 2. Add some or about ½ cup of water immediately. Higher the flame and give a quick boil. Now lower flame as this way all the milk fat will separate nicely and turn into chaana properly. You can now see clear whey. 3. Line a big bowl with muslin cloth or cheese cloth. Drain the whole chaana or cheese and whey mixture on this. Discard the whey. Now tie the loose ends of the cloth and place it under running water. Squeeze it well and keep it side. You can skip this stage by buying paneer from the store. However, I prefer to use fresh homemade chaana for this recipe. 1. Take a mixer grinder and add all the pointed gourd seeds, 2 green chillies and 1 inch ginger to make a fine paste. 2. Now, mashed the boiled potato and chaana properly. 3. Take a frying pan and heat oil. Now, add the paste and stir well. Now, add salt and sugar and mix well. 4. Add mashed potato and chaana and stir continuously. 5. Now, add roasted cumin powder, Garam Masala powder, raisins and mix everything well. Cook for 1-2 minutes until the mixture becomes little dry. Switch off the flame and keep it aside. 1. Take the curd in a bowl and mix it very well by adding little salt and sugar. 2. Heat a pan and add oil. Lightly fry the pointed gourds by adding little turmeric and salt and keep the pointed gourds aside. 3. Now, put the stuffing mixture into the pointed gourds and press it lightly so that the mixture will reach at the other end of the parwal. Cover the pointed gourd with the cut piece cap that we previously kept aside and tighten it with one toothpick. Do the same process with other pointed gourds. If possible keep little stuff aside to use it later on the gravy. 4. Now heat oil in a pan and add whole Garam Masala (Cinnamon, cardamom and cloves). Once it spreads smell, add ginger paste, poppy seeds paste and curd and mix everything well. Add 1 Tbsp water and cook for 1-2 minutes. Now, add all the spice, powder turmeric powder, red chilli powder, salt and sugar and mix everything well. Cook for another 2-3 minutes. 5. Now, add water and cover with lid until the gravy boils properly. Once the gravy boiled, add stuffed potol into it and cook it in medium flame until all the parwals cooked properly. Now add the stuffing that we kept aside in this gravy and mix well. Add Garam Masala powder and roasted cumin powder and mix well. If you want, you can add ½ tsp ghee in this gravy to give a sweet smell and taste. 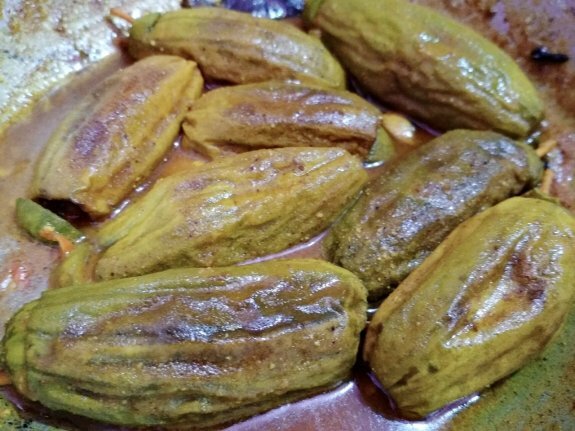 Your Potol er Dolma is ready to be served with Rice, Roti, Paratha in any Bengali festivals.